On 15th November, 2018 Public Private Partnership Authority organized a full day workshop at PPPA Conference Room. The purpose of the workshop was to bring together all the Project Directors (PD) and focal point officers of the ministries/divisions to share their experiences and to identify ways for supporting them through removing barriers in implementing PPPs. About 45 participants attended in the workshop. In the introductory session, the workshop was chaired by Syed Afsor H. Uddin, CEO of PPP Authority. In his speech he highlighted the role of the PPP Authority in Bangladesh. Later on, Md. 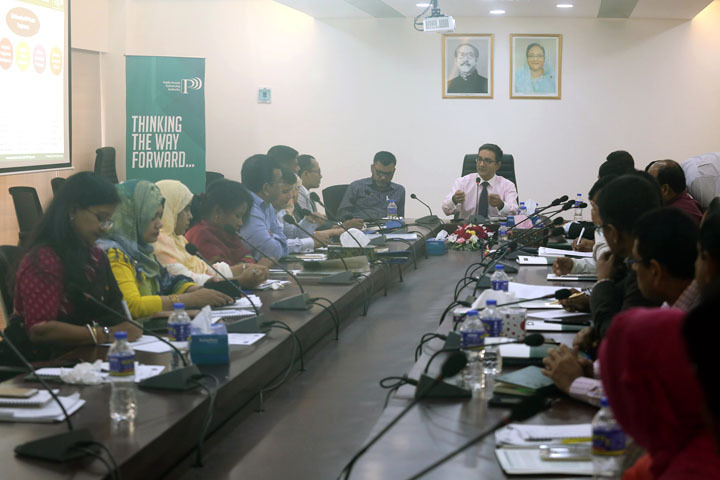 Faruque Ahmed, Director General of the PPP Authority explained background of the workshop and offered justification on why engaging PDs matters in PPP delivery. The main business session started after the introductory session,where PDs and focal point officers shared their experiences and challenges in implementing PPP projects. Mr. Md. Abul Bashar, Director General, PPP Authority highlighted various PPP processes and moderated the workshop. Decisions regarding PPPs taken at the 2nd Board of Governors meeting were also emphasized. A brief presentation was made by the PDs on some ongoing projects and then through interactive discussion with them challenges in implementing projects were identified. Some of the major challenges as identified are limited capacity and resources at the agencies, timely approval of the documents and funding arrangement of linked projects. At the end the sessions, Questionnaires and Feedback forms were circulated among the participants. In the concluding session, Md. Nojibur Rahman, Principle Secretary to Prime Minister, PMO joined the workshop as Chief Guest. Principle Secretary thanked the participants for their contribution to this workshop. He advised PPP Authority to develop a handbook to facilitate understanding about PPPs and its implementation processes in the country in more brief and lucid way. The workshop is expected to have deeper impact on PPP implementation processes in future through knowledge sharing among the PPP practitioners.